2017 Door County Beer Festival in Baileys Harbor. Photo by Len Villano. Tickets to the 2019 Door County Beer Festival are now available at DoorCountyTickets.com, just in time to add them to your Christmas gift list. 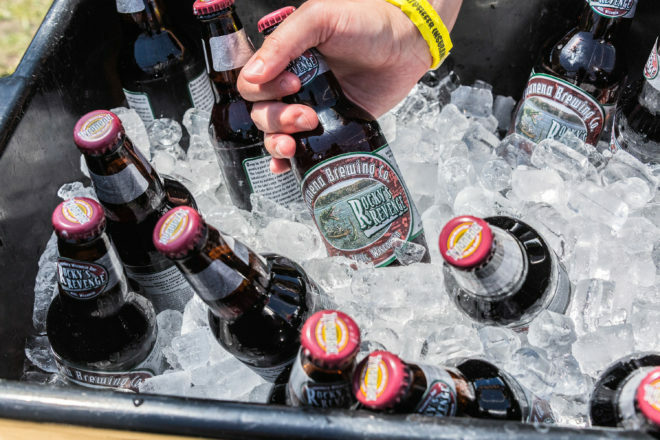 The festival has earned a reputation as a favorite of beer lovers, with more than 40 breweries represented and more than 150 beers available for sampling. The festival returns to Baileys Harbor on June 15, 2019, and will be held under big tents next to Door County Brewing Co. Taproom and Music Hall. Get unlimited samples from some of Wisconsin and the Midwest’s favorite craft brewers, as well as new breweries offering hard-to-find beers. The grounds will also feature live music and great food served street-food style from six great Door County restaurants. General admission tickets are $40 and include unlimited samples from noon to 4 pm. VIP tickets are also available for $55. VIP attendees get general admission access, plus early entry to the VIP tent featuring special beers exclusive to the VIP tent. The VIP tent also includes tables, seating, and its own bathrooms. Buy tickets at DoorCountyTickets.com, or find more information at doorcountybeerfestival.com.